With a quality similar to the Cyclone line, Hurricane Granite Turbo Blades sport a more affordable price. Designed to cut Granite, Marble and Engineered Stone, its Turbo design allows for fast cutting with minimal chipping. One of its variations come ready with Quad holes, making it ready to Flush Mounting. 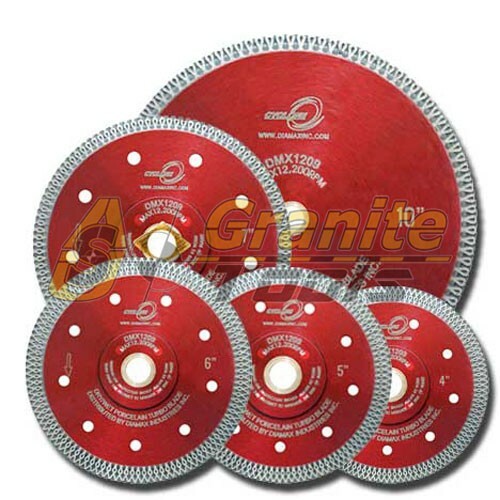 Stone Plus Granite Turbo Blades, with a high Diamond Concentration, have extra Long Life. Superior quality, comparable with highly priced Turbo Blades. Hurricane Dry/Wet Core Bits are high performing Core Drill Bits, which belong to an economy line of Diamax. Its new design with Side Protection and mini T-Segments guarantees better durability. With a very attractive price tag, it is an excellent choice. Cyclone Dry/Wet Core Drill Bits have side coating and larger cooling holes, which produce faster, cleaner cuts without breaking or Chipping. The segments employ the most advanced diamond pattern yet, giving the Dry Core Bit maximum performance and long life. Cyclone Dry/Wet Turbo Core Bit can Core a hole in only 30 seconds. Simply using at the recommended speeds, allows the bit to cut through granite in just half a minute, leaving a smooth hole with little to no chipping.